Free Video to JPG Converter for Windows XP - utility that creates cumshots. Takes photos from video clips and exports them to a JPG extension. Due to the settings of the program, you can determine the frequency of shooting, as well as the number of frames to be taken. The paths for the file being processed and the storage location are set separately. The utility takes a photo taking into account the differentiated frequency of images. This parameter is set manually, or selected from the options. The application has the option of frame coding. The final quality with a resolution similar to the original video files. 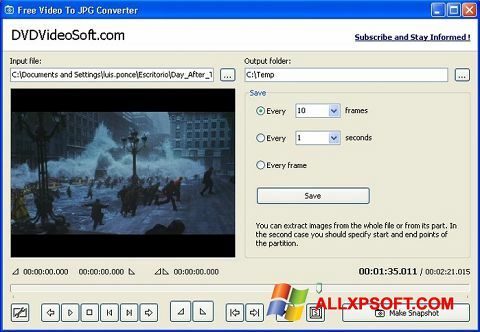 You can free download Free Video to JPG Converter official latest version for Windows XP in English.